1. LeatherFace from "The Texas Chain Saw Massacre"
Leatherface is a fictional character in the The Texas Chainsaw Massacre movies. 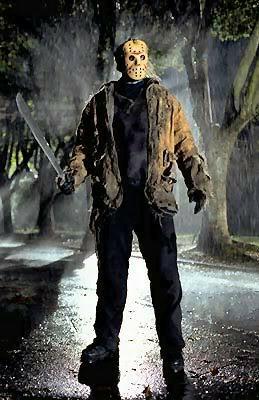 One of the first slasher film villains, he has appeared in all six of the series' films since the release of the original in 1974. 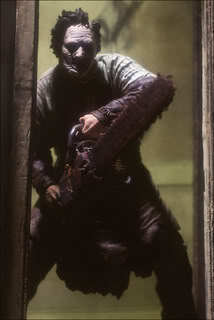 The character wears masks made of human skin, a practice which led to his name, and is a cannibal. Leatherface is portrayed as "severely mentally retarded and mentally disturbed," and often uses a chainsaw and sledgehammer to slaughter his victims. He lives with a family of mentally disturbed fellow cannibals, who are often abusive and violent towards him. The character was inspired in part by notorious serial killer Ed Gein, who also wore the skin of his victims. 2. Jason Voorhees from "Friday the 13th"
Jason Voorhees is a fictional character from the Friday the 13th series of slasher films. He first appeared in Friday the 13th as Mrs. Voorhees' son, portrayed by Ari Lehman. Created in combination by Victor Miller, Ron Kurz, Sean S. Cunningham and Tom Savini, he was never intended to carry the series as the main villain. Jason Voorhees has also been represented in numerous novels, comic books, and a cross-over film with another horror legend, Freddy Krueger. 3. Freddy Krueger from "A Nightmare on Elm Street"
Frederick Charles "Freddy" Krueger is a fictional character from the A Nightmare on Elm Street series of films. Created by Wes Craven and portrayed by actor Robert Englund in every film of the series, he is an undead serial killer who can attack his victims from within their own dreams. Freddy is commonly identified by his burnt, disfigured face, red and green striped sweater, brown fedora hat, and trademark metal-clawed leather glove, which he fashioned himself. His full name has been listed as Frederick Charles Krueger. Wizard Magazine rated him the 14th greatest villain of all time, and he came in 8th on British television channel Sky Two's Greatest Villains of All Time and ranked 40th on AFI's 100 Years... 100 Heroes and Villains list. 4. Michael Myers from "Halloween"
Michael Myers is a fictional character from the Halloween series of slasher films. He first appears in John Carpenter's Halloween as a young boy who murders his older sister, then fifteen years later returns home to murder more teenagers. In the original Halloween, the adult Michael Myers, referred to as "The Shape" in the closing credits, was portrayed by Nick Castle for most of the film, with Tony Moran and Tommy Lee Wallace substituting in during the final scenes. He was created by Debra Hill and John Carpenter. 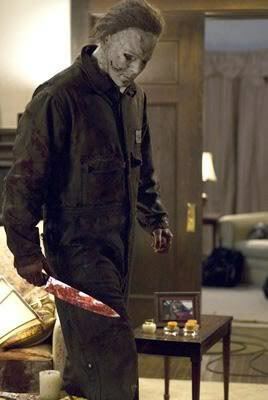 Michael Myers has appeared in eight films, as well as novels, a video game and several comic books. The character is the primary antagonist in the Halloween film series, except Halloween III: Season of the Witch, which was not connected in continuity to the rest of the films. Since Castle, Moran, and Wallace put on the mask in the original film, six people have stepped into the role. There have been no actors to portray the character in consecutive films, with a new actor filling the role in each succeeding film; only one actor has portrayed the character more than once. Michael Myers is characterized as pure evil, whether directly in the films, by the filmmakers who created and developed the character over eight films, or random participants in a survey. 5. Jigsaw Killer from "Saw"
The Jigsaw Killer is a fictional character in the Saw film series. Jigsaw made his debut appearance as the primary antagonist in the first film of the series Saw, and later Saw II, Saw III and Saw IV. He is portrayed by American actor Tobin Bell. Jigsaw is introduced in the series as Jonathan Kramer, a patient dying from an inoperable frontal lobe tumor that had developed from colon cancer. In the series, Jigsaw usually builds deadly traps for his subjects, which are often a symbolic representation of what is seen as a flaw in the person's life. Jigsaw calls these tests "games", and tells the person the "rules" of the game usually by audio or video tape. The rules are tasks that the person must perform in order to pass the test and survive; however, the tasks often involve extreme self-mutilation, although Jigsaw on occasion has used psychological torture for the subject's test. 6. Chucky from "Child's Play"
On November 9, 1988, Charles Lee Ray, the notorious "Lakeshore Strangler" was being chased down a street by a cop, Mike Norris, who proceeded to fire on Ray, fatally injuring him. Bleeding heavily, Ray stumbled into a toy store and collapsed into a pile of Good Guy dolls. Knowing he would probably die, Ray used voodoo to transfer his soul into one of the dolls. The store was then struck by lightning, and it burned to the ground. Before he died as a human, Ray had randomly murdered several people, many of whom simply got in his way. For ten years, he attempts to use six-year-old Andy Barclay to transfer his soul into since Andy was the first person to whom Chucky revealed his secret, and thus the only person Chucky could transfer his soul to, in accordance with the voodoo spell. Ten years later, Tiffany, Chucky's fiance' reassembles and brings him back to life. 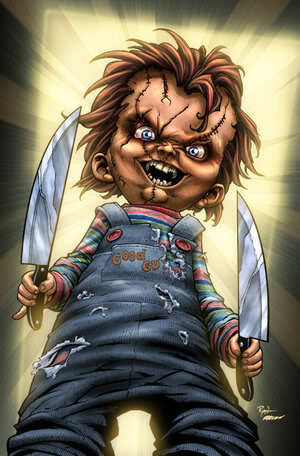 When Chucky admits that he never intended to marry her, Tiffany imprisons him in a crib, but Chucky manages to escape. He electrocutes Tiffany by pushing a TV in the bathtub, and transfers her soul into a doll. After reconciling, the couple embarks on a murder spree, culminating at the cemetery where Chucky's human body is buried, as they need to get The Heart of Damballa, in order to transfer their souls into human bodies. But Tiffany has other plans: she slyly asks Chucky to kiss her before they appropriate human form, but suddenly grabs his knife and stabs him. The two dolls fight to the death, after which Tiffany is discovered by a cop. Tiffany manages to give birth to an androgynous baby doll Glen/Glenda, dying shortly afterward. marami ka pala ma222nan d2 sa forum natin e! !